Use your VaporFi points to order free vaporizers, E-liquids or accessories. Best of all they are completely free. Check all the fun ways below to earn your free points. 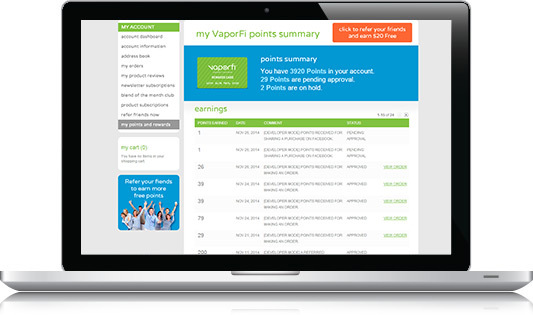 For every 4 AU dollars spent on VaporFi store, you will earn 1 point. 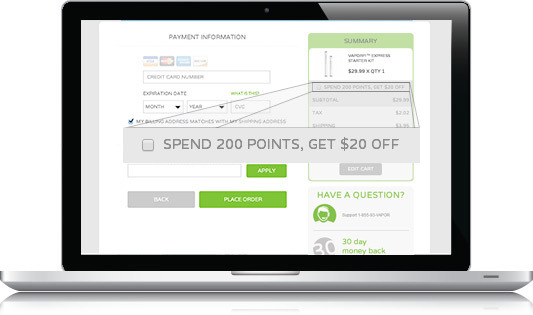 When you earn 200 points, you will get a US $20 credit towards your next purchase! Rewards Points can be used on any future orders, even Sales items. * Make sure you create an account and are logged in when shopping to be eligible for points. Through the VaporFi Rewards Club you can send your friends an exclusive $10 USD OFF their first order. After their first purchase, we will give you 20 VF POINTS as a thank you. Share it with your friends on Facebook and get points for sharing. You can share as many products as you want (limited to 3 shares per day). Click on the 'My Account' link on the top of our website and log in. Once logged in, you will see the number of points you have in your Dashboard. Click on 'My Points & Rewards' on the left menu to view your points history and details. You can browse through our site and shop as normal. Simply add the products you want to your shopping cart. 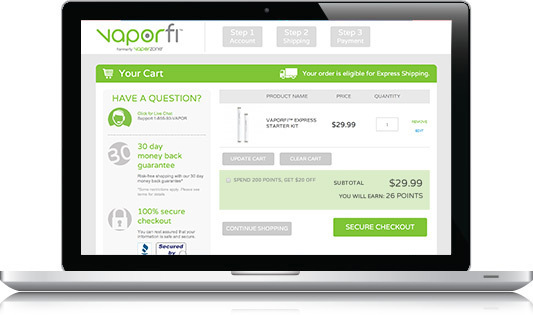 Redeem your VF Points by selecting the checkbox "SPEND 200 POINTS, GET $20 OFF" on the Shopping Cart or Checkout pages of our website or at any VaporFi retail location.